"Licence and registr... wait, what?!" A police officer was caught by surprise recently when he pulled a motorist over for driving too slow, only to discover there was no one behind the wheel. 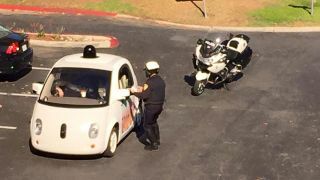 The reason for empty driver's seat was that the vehicle in question was a new variety of self-driving car from Google, which had had its top speed limited to 25mph. The moment was captured by Facebook user Zandr Milewski near Google's headquarters in Mountain View, California. Commenting on the post, Milewski claimed he had talked to the car's "driver" – we assume he meant the guy chilling in the passenger seat – and said "apparently MVPD (Mountain View Police Department) doesn't get NEVs (Neighborhood Electric Vehicles) and pulled them over to ask why they were all going so slow." Google's clearly playing it safe with its self-driving cars, preferring a Driving Miss Daisy approach over anything Fast & Furious might inspire. In a Google+ post addressing the incident, Google's Self-Driving Car Project claimed "We want [self-driving cars] to feel friendly and approachable, rather than zooming scarily through neighborhood streets. "Like this officer, people sometimes flag us down when they want to know more about our project. After 1.2 million miles of autonomous driving [that's the human equivalent of 90 years of driving experience], we're proud to say we've never been ticketed!" Let's see if Google can maintain that clean record when it starts ramping up the speed.